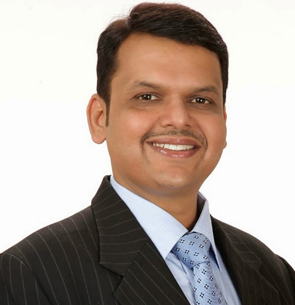 Devendra Gangadhar Fadnavis is an Indian politician belonging to the Bharatiya Janata Party (BJP). He is currently serving as the Chief Minister of Maharashtra. He took oath of office on 31st October, 2014 at Wankhede Stadium in Mumbai. He became the second youngest Chief Minister of the state at the age of 44. Mr. Fadanvis has been recognised for his legislative activities both nationally and internationally. He was recognized by the Commonwealth Parliamentary Association with the ‘Best Parliamentarian Award‘. He has been elected as a secretary of the Global Parliamentarian on habitat. He is an expert in government budgetin and his analysis of the annual national budget is eagerly awaited every year. He authored two books on government budgets – How To Understand & Read State Budget’ and another book explaining budgetary concepts and understanding state budget documents.